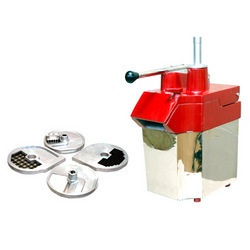 We manufacture a wide range of Pre Preparation Equipments that is offered at competitive prices. These are used in various applications to make the cooking easier and suitability for food processing. These products are made by using quality material to ensure their durability and corrosion resistance. We offer them with different sizes and shapes which are easily installed and maintained. These are applicable in hotels, restaurants, food courts and canteens. With the help of our expert professions we provide a high range of standard quality Pulverizer - wet which is widely used in various industries for crushing even hard material effectively. We offer them at cost effective prices at international standard. Our products are tested on various aspects to ensure safe in usage. These products are provided as per the specification mentioned by clients. These are easy installed and maintained. Pulveriser LP-20, 1500 W, 230 V, 2900 Rpm. The gap between the blade and the teeth in the chamber is minimal, which increase the output capacity without affecting the taste of the contents. Special set of mesh for for grinding from coarse to fine. Will grind anything from Wet to Dry hard material. 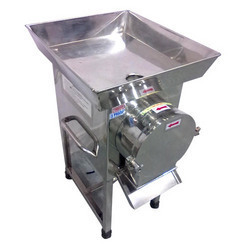 Vegetable Processor which is manufactured with quality material finds application for cutting and chopping of vegetables. We manufacture them with different attachments for cutting fruits, cheese and vegetables. These products are effective in performance and safe to use.We offer them at competitive prices at international standard. They are highly appreciated for long life and maintenance. These are compact in size and accurate in functioning. 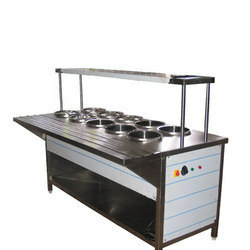 Bain Marie Counter with 2 Overhead shelf have several compartments which are made of standard quality stainless steel. These counters are widely used by the clients and highly in demand in market.These Bain Marie are used to keep the food warm for a period of time. 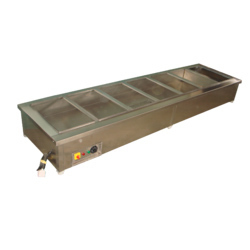 We manufacture and supply Bain Marie two counters to the customers at wide range. These Bain Marie Table Tops are light in weight and have rust free body. Our ranges of these products are well known for their high durability, sturdiness and impeccable design. We manufacture these using premium quality stainless steel materials and latest technology. They are available in different sizes and dimensions as per the customized specification laid by the customer. They are highly demanded for their durability, versatility, high efficiency, and are easy to use. Looking for Vegetable Processing Equipments ?